We're now on day 4 of removing this mole and it's going great. 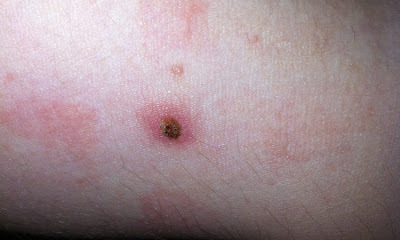 As you can see from the picture above the mole has become really discoloured and it's not so black any more. The texture of the mole has changed and it's become rather crusty, almost like a scab. The redness around the mole has become a little worse but it's just from the irritation from the Apple Cider Vinegar. I'm not too worried about it as I feel it will fade once I stop applying it to the area. There is no more blood when roughing it up with the needle also which is good. Pleased at how fast this is working and I now feel like it's going to be successful.